Most of my friends are on diets. I should be too. I really WISH I could be on a diet, but I just don’t want to. This does not stop me, however, from wanting to be healthy and to eat healthily. In fact, their diets, have helped inspire me to come up with new ways to cook healthy foods and attempt to make them yummy! I guess this should be my goal every day, actually! Anyway… The challenge was to cook a delicious meal that would satisfy those on diets and those not on diets at the same time. Yesterday was a REAL spring day with REAL spring weather and as it was my turn to cook for our group’s weekly meal, of course I headed outside to the sunshine and the grill. I didn’t want to heat the house so I was determined to do everything without a stove or oven. I threw tenderloin steaks and asparagus on the grill, made an avocado/mozzarella/tomato salad, and threw together a banana pudding made with coconut milk. 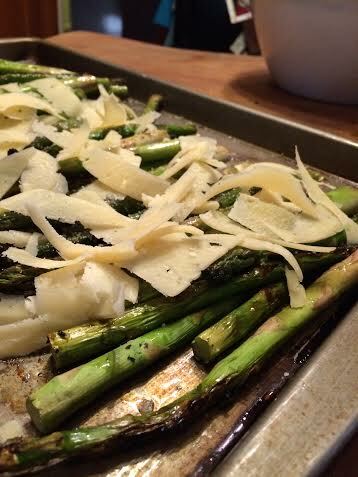 I am going to tell you guys how I did the asparagus. I was really proud of myself and I think it turned out really well. Try it for your next cookout! 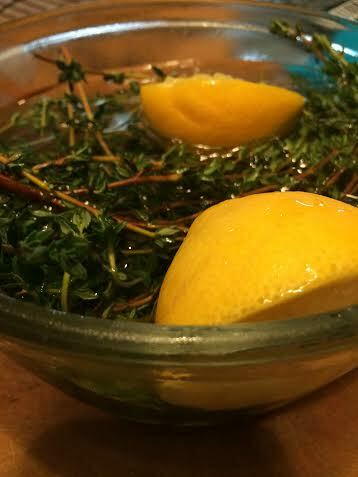 Wash the fresh thyme and place it in a bowl. Cover the thyme with fresh water. Squeeze one of the lemons into the water and drop the lemon halves in also. Let it sit for several hours or in the frig overnight. This will keep the thyme from burning up immediately on the grill. 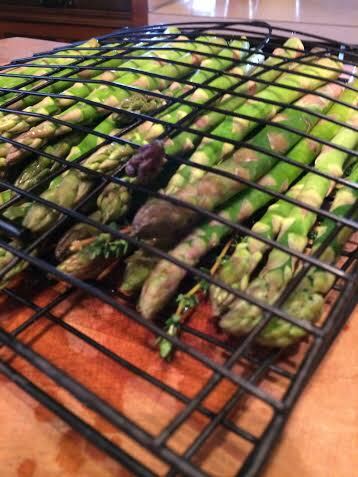 Arrange the asparagus on top of the thyme and close the basket. Then drizzle both sides with olive oil. 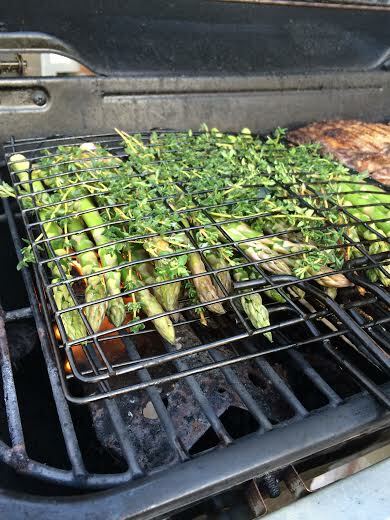 Place the basket on a medium grill, asparagus side down, for 8 minutes. Flip the basket over and let it grill for another 8 minutes or so. 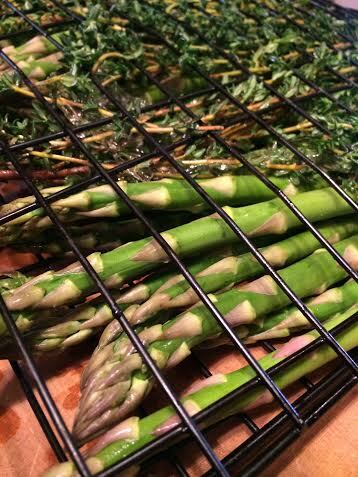 When the asparagus is done, remove it from the basket and the thyme. I used tongs and laid it all out on a cookie sheet. Drizzle with a bit more olive oil and the juice of the second lemon. 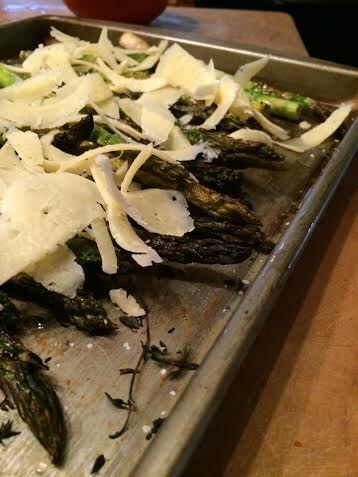 Salt and pepper the asparagus and sprinkle the cheese over the top. Serve warm or chill and chop it and toss it in a salad! That sounds good. Make this for me sometime.